VPN – Virtual Private Networks can help you in this internet world. It can help you to access a website or service completely hiding your identity. It can also help you to access services which are restricted to some counties alone from any place., you can bypass country restrictions easily. It gives you better security and anonymity. Steganos is giving away one year Free VPN service in association with PC Format magazine. 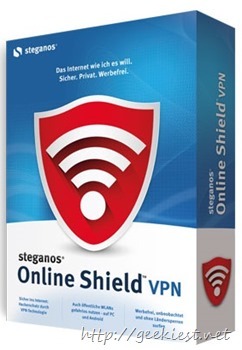 You can get Steganos Online Shield VPN service for free. To get this you can open the promotional page here and enter your email address and click “request Serial Number” button. Before clicking read the text near to the checkbox and do as per your requirement, you may or may not subscribe to the newsletter. You will receive an email with the serial key and also the links from where you can download the VPN.